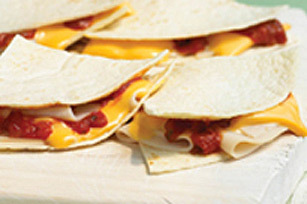 Add some turkey to your quesadillas for a quick fix on lunch or afterschool snack time. Use your microwave to get this warm tortilla on the table in 5 minutes flat. Spread 1 tortilla with salsa. Cover with turkey and Singles; top with remaining tortilla. Microwave on HIGH 30 sec. or until Singles begins to melt. Cut into quarters. Prepare as directed, spreading second tortilla with 2 Tbsp. refried beans before placing, bean-side down, on the quesadilla. This Turkey Quesadilla is a nutrition winner! The flour tortillas provide an excellent source of iron and the Kraft Singles are a source of calcium.